I came across the easy and effective method of microwaving corn on the cob a few years ago and found it to be excellent. I was thrilled to find a much easier way to enjoy the bounty of summer corn than I had employed in the past. This led to many enjoyable ears of corn. However, I forgot about the method in recent times until I came across an endorsement for it in a summer issue of Bob Appetit magazine (yes, I read Bob Appetit) featuring the antics of a corn-cooking guru named Ken. First, I was thrilled to see the method mentioned in such a place and second, it was great to have been reminded of a great way to enjoy fresh corn without too much hassle. There is a link to a YouTube video demonstration of the method on Bon Appetit’s website. 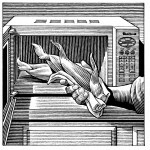 Not only does the microwave method lead to tender corn, it helps you shuck the husk virtually silk free! Try that with your pre-cooking husking process. Find the tips for microwaving fresh ears of corn on the Bon Appetit website here. I know many kids have been back to school for a couple of weeks already, but I can’t get my head around school until after Labor Day, so talk to me on Tuesday. Although I have not gone “back to school” in a very long time, old habits die hard. Every year around this time I use the unofficial change of seasons as an excuse to go “back to school shopping” and buy a new wardrobe and school supplies. I love clothes and I love desk items, especially pens and stationary as I am sure you have gathered from my past posts – so any excuse to buy either is welcome in my world. Today, I am featuring the back to school collection from Stubby Pencil Studio. 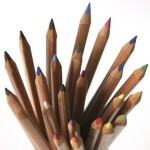 I love everything these guys sell, but I am particularly fond of their set of 24 Triangular Colored Pencils. I ordered a set of these and can’t wait to do a few colored drawings with them. I promise to stay inside the lines… not! See the complete back to school collection from Stubby Pencil Studio here. There is still plenty of summer left despite the imminence of Labor Day. In fact, I have not even been on my traditional summer vacation yet. It is coming up in a couple of weeks when I head to the lovely Cape Cod town of Wellfleet, and I can’t wait. One thing that is sure to happen while I am on vacation is a visit to a seaside candy shop or two. You know the kind – plenty of freshly made fudge, “penny” candy and of course, saltwater taffy. There is something about saltwater taffy that screams summer. I have great memories of being a small child and watching the big taffy pulling machines working their magic. 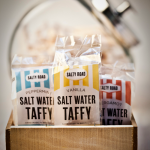 My nostalgia for taffy is what attracted me to saltwater taffy of Salty Road, a New York-based company that is making the stuff for a new generation. I like these newer entrepreneurs that are reviving and continuing great traditions, like making taffy and keeping the memory of summer alive all year long. Visit the online store of Salty Road here. 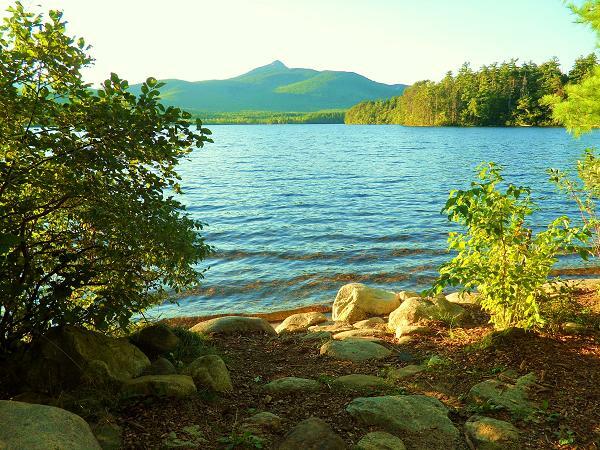 I took this shot looking over Lake and Mount Chocorua in Tamworth, NH this evening as the sun was low in the sky and bathed everything in a bright light. I love the mix of shadows on the slopes with the pale green glow where the harsh sunlight hits. Meanwhile, the greenery in the foreground is washed out by the light giving a hint of the autumn colors to come. I think I have mentioned before that in recent years I have collected a few vintage travel guides. My favorite finds are a few very well worn guides that included the notes and inserts of the books’ former owners. I have also kept the more modern travel guides I have collected over the years as a reminder of my trips and as casual reading for visitors to the upstairs powder room where I keep them. While paging through some of my vintage travel guides, I have often gotten lost in thinking about how things have changed – or not – in various locations over the years. Which is why I was attracted to Europe on 5 Wrong Turns a Day: One Man, Eight Countries, One Vintage Travel Guide by Doug Mack. In his fun book (and companion blog) Mr. Mack shares wonderful stories and experiences as he takes his mother’s Europe on Five Dollars a Day guide and her colorful stories over the years, and shares them with us on his little odyssey. Of course five dollars don’t cut it anymore, but it is interesting to see some things little changed in the past 50 years. Europe on 5 Wrong Turns a Day is a delightful escape and plays into the little dream many of us hold inside – the idea of taking off on a trip abroad to discover something special about ourselves and our connections to the world and our collective past. 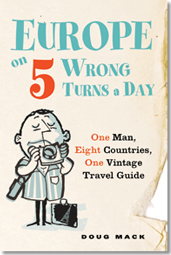 Europe on 5 Wrong Turns a Day: One Man, Eight Countries, One Vintage Travel Guide by Doug Mack is available from Amazon and other fine booksellers. Visit Mr. Mack’s blog and website here. I love hummingbirds. I have set up a series of six or so hummingbird feeders out on the back porch and love watching – and hearing – the amazing little birds fly up, take a sip from the feeder, and buzz away. My feeders are pretty humble, but they seem to do the trick. That said, I have fallen in love with the hummingbird feeder collection of BamBeco. These gems are more than just feeders, they are works of art. I particularly like the Carnival Hummingbird Feeder. 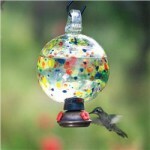 See all the complete BamBeco hummingbird feeder collection here. 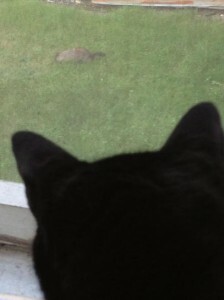 The other evening while relaxing out on my back screen porch (my “summer White House”) I noticed my little cat (Bear) was all of a sudden paying a lot of attention to something out in the yard. I got up to see what she had spotted and sure enough it was the groundhog (dubbed “Groundy”) who makes appearances every now and again. 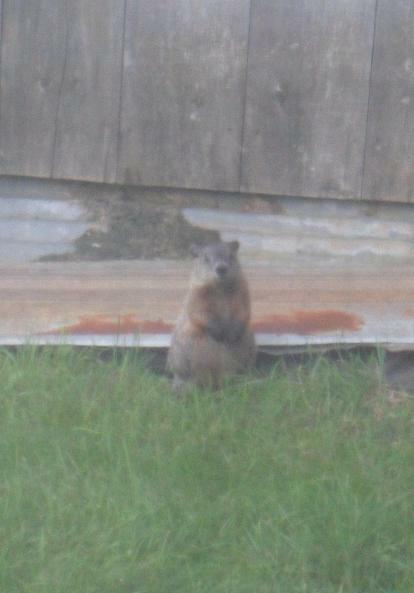 By the time I got the camera to take a better picture through the screen, Groundy had seen us and struck a pose (below). I had not seen Groundy for a awhile, perhaps because he hasn’t been coming out in the heat of the summer too much for me to see. …I was very happy to see him again. I am acutely aware of the alarming number of French-related posts I have made over the summer. Am I turning into a Francophile? Will my inner Anglophile want to beat up my inner Francophile and vise versa? I hope not. But I will have to explore this topic in the future. For today, I am featuring the cookware of Emile Henry France, which is, well, French. 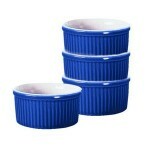 I love many of the Emile Henry products, but I particularly like this Stackable Ramekin Set in Azure. All the Emile Henry products are made in Burgandy where the fine cookware has been made for more than 150 years. Seriously, who couldn’t use a new colorful ramekin set? See all the great kitchen and cooking products of Emile Henry France here. While riding my bike around the back roads of Carroll County, New Hampshire this summer, I have stopped many times to take a snapshot of the scenery. I have taken pictures of the wildlife, the plant life and the occasional sign that pops up all of a sudden. Here is a little review of some of the signs I have seen so far this summer. I stumbled upon a cranberry bog quite literally in the middle of nowhere. Who knew? On the Tamworth/Sandwich, NH border, far from the Oceanside bogs New England is known for I turned a corner around a pond and saw this sign. On the first Saturday after the Fourth of July, a charity auction is held in support of the Tamworth volunteer firemen, here is the sign that went up after the auction this year. It seems that summer is when the whole state of New Hampshire get “fixed” – these work zone signs can be spotted all over the place. One of my favorite farm stand signs I pass by on just about every bike ride. You have to love PYO blueberries. Entrepreneurs are everywhere – I often see produce, firewood and other goods offered on the side of the road under the honor system. Of course yard sales abound. I am not the “greenest” person out there as I produce a lot of trash. But I do recycle as much as possible and I rarely toss out anything that has even the slightest perceived value – as the many fully loaded bins in the barn can attest. However, from time to time I see things that can get me to change my ways a little bit to help contribute to a greener society. Such is the case with the “RIDE” Bicycle Reusable Lunch Bag available from Kelly Green Home. Of course by now you have figured out that the real attraction to this lunch bag is the fact that it features a bicycle – one of my favorite motifs. But I also like the idea of a little bag like this that I can keep things in – lunch items and otherwise – which now just roll around in any one of the many conveyances I use when traveling about. And heck, if I can save the planet at the same time, that’ll be cool too. 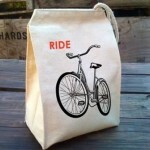 See the “RIDE” Bicycle Reusable Lunch Bag and all the “green” products of Kelly Green Home here. Lost Cowboy is powered by	WordPress 5.0.4 and delivered to you in 0.984 seconds using 58 queries.